The U.S. Geological Survey’s Hawaiian Volcano Observatory (HVO) recorded a magnitude-4.2 earthquake located off the northeast coast of O‘ahu on Friday, September 15, 2017, at 8:40 p.m. HST. 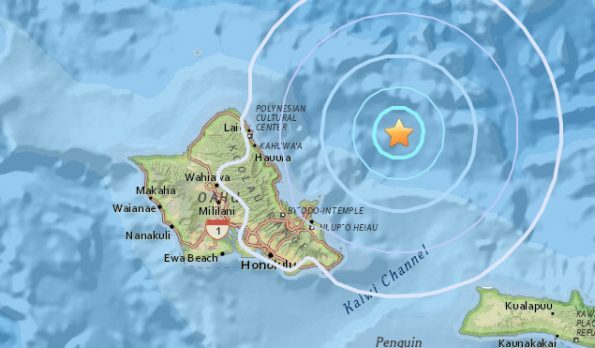 The USGS “Did you feel it?” website (earthquake.usgs.gov/dyfi/) received over 500 felt reports ranging from Kaua‘i to the Island of Hawaiʻi. The maximum intensity of shaking reported was IV on the Mercalli Intensity Scale, indicating light shaking. TSUNAMI THREAT FROM THIS EARTHQUAKE.